I woke up this morning with the house to myself. I was going to either just lounge around or clean but there is this room, sitting there for weeks, that I started painting and pulling off the wallpaper. I decided instead to get a little more done in the room today. I have had to put it on hold because of pain issues after a few neck surgeries, but I was feeling plucky this morning. 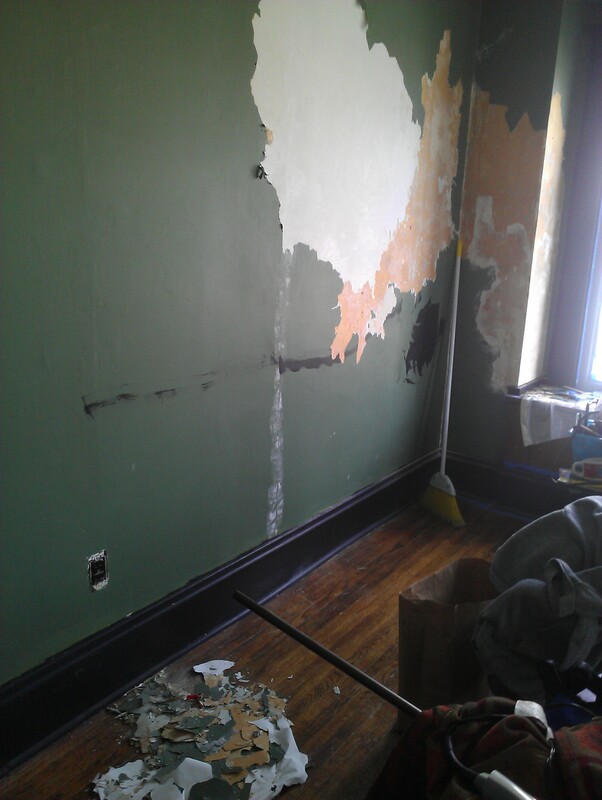 As I am tearing wallpaper off and scraping I realized it was a lot like my life. You see, I am a recovering addict in a Twelve Step Program. I felt like this room was one of the pieces inside of me that I decided to work on for the day after letting it sit partly torn apart for a long period of time. The wallpaper is like peeling away the layers from my past to get to a new surface to graft new ideas and a new life. Some parts are easy and peel away in chunks, some parts are stuck and I have to put a lot of effort into it, some parts aren’t ready to come off today or I am in too much pain or too tired to work at it. No matter what, however, removing any of it requires some form of action. If I just sat in the middle of the room and made a decision to change it and followed with no action, the room would still be sitting there making me uncomfortable, not how I want it to be or wish it to be. My sponsor has said several times since I’ve known her, that the only person who walks your entire journey with you from beginning to end completely, is you. It made me think of how I have had to ask people to come help me at times with the project. I had to first let people know that I was doing some work in this room for anyone to even know I needed help. Some offered with no asking, some I had to ask a few times before they finally came over, some couldn’t because they didn’t know how. Some of them were there at the beginning and some later on. Some people were better at helping and some tried but didn’t have the experience and I had to go back over those parts again myself. Some made things a little worse than when I started. Others still could not help and then some sat and watched and did nothing as the walls came down right in front of them, knowing I needed the help, after I had asked them and they were capable, but they were unwilling to help or too stuck in their own mess to even notice. I didn’t finish it today and that is ok, I even left it a mess but swept a little bit to organize. It will be there when I am ready to do the work, and God knows I will need help. I will go through pain after making these changes today and that is ok too. That is the beauty of living Just For Today, there is always a tomorrow. Well, I had an eventful morning. I went out to get coffee and cigarettes (first let me say, uh, yum) immediately upon rolling out of bed. I was at the 7-11 talking to an old friend I grew up with for a while about a few different subjects on family and life. As I went to leave there was some commotion outside. I learned two things today and they both lead to the same conclusion; what the motto of F33DyourHEAD is and my own personal motto since I can remember. 1. Educate yourself on what your kids are being taught; whether in school, church, girl scouts, boy scouts, etc. My friend talked recently with my sister who told her their church told her kids that there is no such thing as Santa. One of my sister’s children is old enough to know this anyways but, the other…..if they only knew that the littlest one’s father died on Christmas Eve, tragically, which will probably scar him for the rest of his life, they might have known better than to strip the one thing away from him on Christmas that still allowed it to be somewhat magical. On a day when sadness is stronger than the joy of ripping open presents and meeting with family he will remember that as the day he learned his father died and now the day when Santa died and nothing in this world is as we hope or believe. Possibly, down the road, he will be ok, but there is also a possibility it could lead to a more negative outcome. My sister tried to correct what they said but it was already too late. 2. Educate yourself when a situation is happening before you go taking pictures, posting them on Facebook and going off on rants which have absolutely nothing to do with what is happening. We were outside smoking a cig, finishing up our conversation and some people drove up and parked at the 7-11 all in a hissy because if we had bothered to look right around the corner we would have seen a school bus full of small children and what looked like it being pulled over, the children taken off and the police officer going on and for some reason a prison bus pulled over on the next block ahead. It happens to be, I found out from my fellows, that today, a local high school was having a protest about bullying because some kid was beat up on a bus and is in a coma (according to the not so sure sources). Here is a link to the actual incident. The issue discussed at a recent school board meeting about school violence, I assume, was the reason for the protest. Again, this is an assumption. They were on their way to the protest. One man feverishly showed us pictures he took of the police pulling the kids from the bus and was figuring out how to post them to Facebook. A woman commented on the sad state of the public school system in our town and city. Another women commented on racism which, even if knowing nothing about the situation, is a large leap in logical thinking and reasoning. The comment started with, Look I’m not racist or anything, but….” and I stopped listening to the rest. The other woman who worked at the store (not my friend) came out to see and commented walking away, “That’s why I don’t want my kids going to public school” and walked back in the store to surely have gone on to tell the unknown versions of the tale to many others walking in that day, thus spreading an uneducated guess on what was happening. There was speculation of a fight on the bus, a possibility that it had to do with the protest, etc. Me, being who I am, said goodbye to my friend got in my car, drove around the block and asked the man filming from the local news, “What happened?”. I was told by the cameraman the bus hit a prison transport vehicle. Again, still not the exact truth. Here is the simple truth of it, according to Steve Thomas (you can find his information here), head bus driver for the Elmira City School District. The prison bus backed up to make room for another school bus and the Department of Corrections vehicle’s rear window moved the mirror on the school bus in question, no damage reported. That’s it. The children were taken off of the bus after the police arrived, which is their call. The procedures state, again according to Steve Thomas, that names and birth dates and positions on the bus need to be recorded. 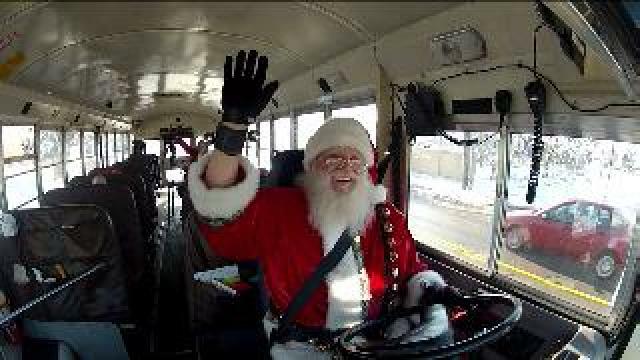 The students were then put on another bus and sent to school. I went online in search of procedures in the event of a collision of a school bus and another vehicle. I have included links to these documents in the article. I tried to do a search for NYS Department of Corrections Accident Procedures but came up with nothing worthy of sharing a link to. I am sure for security reasons these are kept confidential. I tried to find the procedures for Chemung County or the Elmira City School District online and came up with nothing specific, so I did the next available thing and found a procedure for another county in New York State not too far from our own. The police had a right to decide in this case to remove the children from the bus. As for the prison transport van it is unclear whether any prisoners were even aboard. Logic follows that precautions would be taken to ensure that all locks were still functioning and that there were no escapes before almost anything else was done, including removing the children from the bus. If you would like to read further about any of the procedures, please follow the links included in this article. My main point in this second lesson is that without knowing what is happening we can cause a mass hysteria in a city before any facts are even released. People at the protest for bullying today will surely spread the rumors of the school bus seen being “pulled over by police” and their children unjustly dragged from the school bus, assumingly afraid and scarred by the incident and put in potential danger by the proximity of a prison transport van. This can add irrational fuel to an already boiling over issue. When we don’t use the tools available to us to educate ourselves about issues and situations in our lives, things are children and ourselves are being taught, damage can happen, and exponentially so in the second case. Personal responsibility for the knowledge we have or need to obtain is paramount to a saner world.